Because things CAN always get weirder at Toronto City Hall. Famous WWE wrestler, the Iron Sheik showed up to City Hall challenging Mayor Rob Ford to an arm wrestling match. The Iron Sheik, aka Hossein Khosrow Ali Vaziri, was an Iranian wrestler turned WWE heel in the 1980s and 1990s. The Sheik is apparently taking exception to Mayor Ford's drug habits. The Sheik's appearance at City Hall took the City Hall press corp by surprise. Sheik: "ROB FORD MISTER ROB FORD." Reporter: "Who are you?" Sheik: "I'm the Iron Sheik, WWE champion." And, of course, sparked at least one joke about the Camel Clutch, one of the Sheik's closers. Is the Iron Sheik threatening to put Rob Ford in a camel clutch? This isn't Rob Ford's first run-in with a professional wrestler. Earlier this summer, Rob Ford arm-wrestled Hulk Hogan. 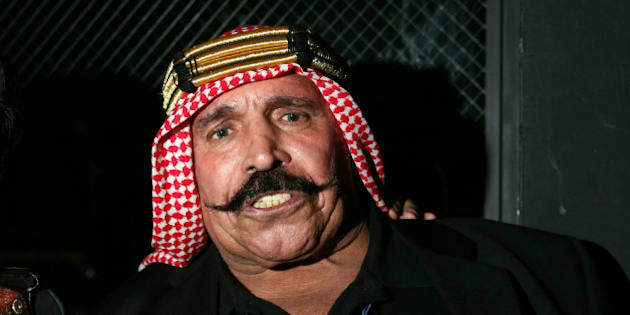 The Iron Sheik is in Toronto for a comedy roast.